Zuan Education, academic wing of Zuan Technology is very happy to invite you to GoDigital, a seminar on Digital Marketing for Business and Career Growth. Digital Marketing is one of the rapidly growing IT sectors. Digital Marketing helps to improve your business tremendously via online mediums and techniques through several strategies.Any individual who has interest in Digital Marketing can achieve a milestone in Digital Marketing. To reach a milestone, we need to know few things about that! In order to make you aware of current Digital Marketing trends and landscape, Zuan Technology is conducting a seminar on Digital Marketing for Business and Career Growth. This seminar will help you understand the basics of Digital Marketing. The seminar will be headed by the top industrial leader. This seminar on Digital Marketing will definitely give hands to non-employable students/graduates to get self-employed and also gives various ideas to the business officials to improve their business. WhatsApp: 988 4868 777 and register now! Don’t miss this rare opportunity. Get ideas worth executing! 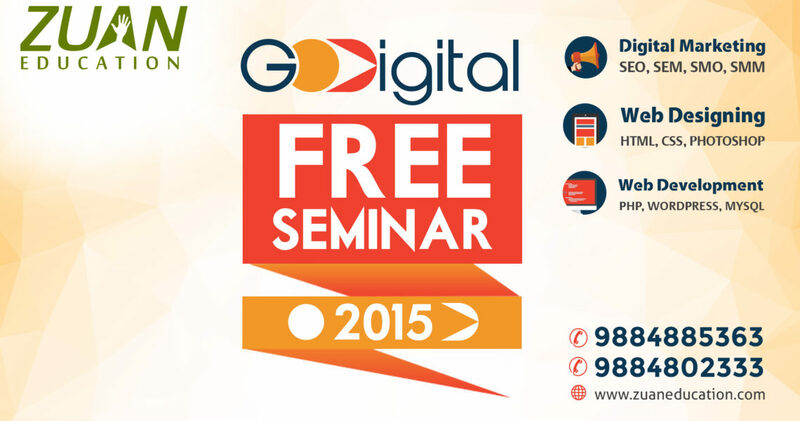 Join our Digital Marketing seminar! It’s time to up your game & #GoDigital! !